Animal control rescued a kitten found "covered in feces and urine” with “a power cord wrapped several times around the kitten’s neck," according to animal control. Animal control in Greenbelt, Maryland, received a call about 4 p.m. Friday for a cat possibly stuck in a laundry room of an apartment building at 6119 Springhill Lane near Greenbelt Middle School. The apartment complex maintenance staff let animal control into the laundry room. Photos show the power cord around the kitten's neck also was plugged into a power outlet. 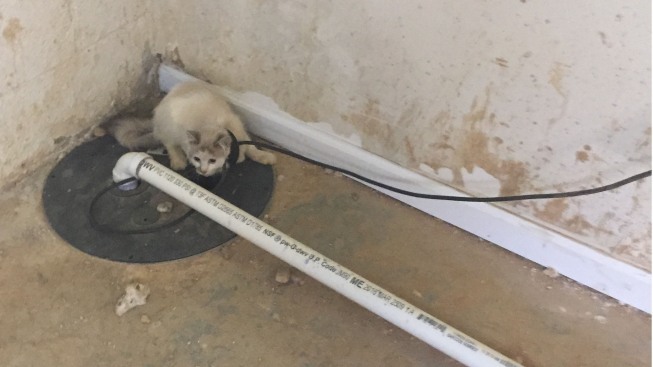 The "terrified" kitten "jumped into a hole where the sump pump is installed," officials said. An officer was able to get the kitten with help from maintenance staff. The kitten appeared to have been tied for several days if not weeks, officials said. Although no one involved has been identified yet, the Greenbelt Animal Control will press felony animal cruelty charges against whoever is responsible. Officer Howard Stanback told NBC Washington that the kitten, whose condition has improved, is "doing good now."